Again, one of the secrets of his faithful personal following will be appreciated by everyone familiar with the mainsprings of practical politics. Lewis is without question the leading criminal and jury lawyer of his state. In this practice he made no distinc­tion for years between the client who could and the client who couldn't pay a retainer. Although sober and successful as a lawyer, he is impecunious. He is in no sense sordid. His enormous industry and earning capacity have never been directed in the line of accumulation. He is of generous temperament, and uniformly kind to the point of servility. Little of that malice which makes for re­venge or the injury of an enemy by under­hand methods, or the meaner satisfactions of private scandal, is discoverable in him. He regards himself statuesquely as a figure of permanence in public life, and therefore refuses to be insulted, no-matter how angry or vituperative the assailant. From the ef­fects of a practical joke —and he has been the victim of severe ones—he recovers as the subject of a clinic recovers from the effect of an anesthetic, seemingly uncon­scious of what he has gone through. 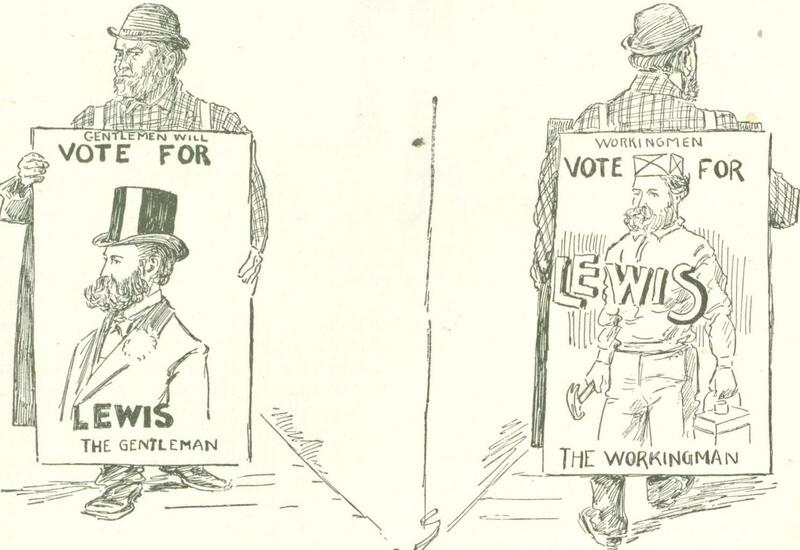 Not the least important factors in the pro­motion of Lewis' political designs have been his unvarying urbanity, his cheerful willing­ness to accommodate anybody and everybody, and his effusive, stalking and grotesque po­liteness. Very early in the game of notoriety he has played so well, he devoted himself arduously to elocutionary training and to the acquirement of manners according to what might be termed a Lewis code of manner­isms. In keeping with his ideas of segrega­tion in the social scale, he differentiates the manipulation of his headwear; and the scope of his salaams is adjusted to the importance of the individual recognized, whether man or woman. To the latter he is foppishly deferential, making it an attitudinarian vir­tue, rain or shine, to keep his hat removed while holding sidewalk conversation with ladies. The colonel has won a considerable and loyal drawing-room constituency with these super-exquisite civilities. Lewis has received many titles. He has been known as "Longshoreman" Lewis, "Dude" Lewis, "Habeas Corpus" Lewis, "Colonel" Lewis, and barely missed being dubbed "Dog-Latin" Lewis. The accompanying autobiography, prepared for this review by himself, is char­acteristic in that it is out of joint with the facts. Considerable doubt exists as to his age. He says that he was born at the close of the War, the vicissitudes of which made him responsible for the support of his pa­rents. Thus he started life as a prodigy of labor in the cradle. The University of Vir­ginia has been queried in vain for confirma­tion of his aluminate. He is not known to men represented by him to have been class­mates. He never loaded ships as a long­shoreman at Seattle. He never taught the dead languages, of which he knows nothing, at the Washington State University. Nor did he teach any other language. He was not nominated for governor in 1892. In making these trifling corrections, the pur­pose is to suggest an idiosyncrasy which stands out as one of the striking peculiari­ties of this very peculiar man. The presence of young Lewis at Seattle nearly fifteen years ago was first made known through the col­umns of the Chronicle. 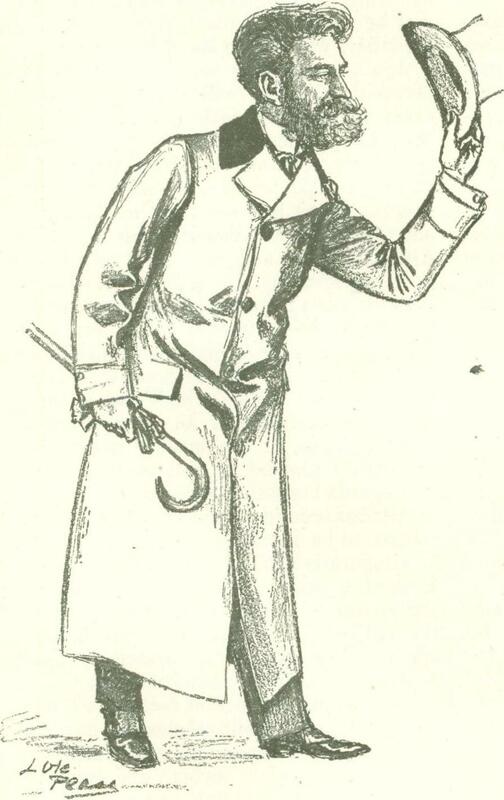 He had called on the editor, decked out in cheap rainbow attire, and wearing a sad-looking stovepipe hat. "I have come out to this terri­tory to go to Congress when it be­comes a state," said he, "and have decided to settle in Seattle to prac­tice law. Now, I would be very grateful if you gave me a little notice. I don't care what you write about me so long as you give me a send-off." The editor took him at his word, describing him as a hand-me-down dude, and quoted him precisely. 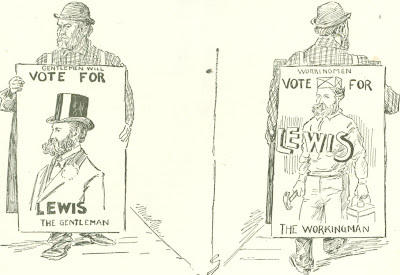 The town laughed at the skit, while Lewis expressed his delight at the kindness of his editorial caricatur­ist. No one took him seriously. He had only a single client in months, and this one he sought as he did many others afterwards. The offender had stolen a box of cigars. Lewis defended him on the pretext that he took the property for safekeeping, and with its restitution secured an acquittal. For this service the future Congressman received eighty cents, half of the capital of the ac­cused. Unable to make a living at law practice, he accepted a position as checking-clerk on the docks. At this work he labored a month and a half. The longshoremen began by making all manner of fun of "the dude." But they discovered in him such amiability and so much frothy erudition that they ended by electing him an honorary member of their union at his own solicitation. Hence a tradition which survives to this day as a factor in his popularity with the laboring classes. His first distinction as a criminal lawyer was earned soon after by securing under habeas corpus proceedings the wholesale re­lease of the prisoners, about twenty in num­ber, serving sentences in the city jail. He was sustained by the territorial court on the contention that the ordinances under which convictions had been secured were invalidated by an error in the territorial code which gave to the habeas corpus act of Charles II a faulty construction. His reward for this service to the criminals was of a convertible variety of valuables ranging from a silver watch to a Siwash pony. "Habeas Corpus" Lewis thereupon em­barked upon his career as police court law­yer, and began the structure of a fabric of friendships among the criminal classes. When the Chinese riots broke out at Seattle in 1886 Lewis joined B Company of the Seattle Rifles as a private, and when quiet was restored, he defended the rioters in court. Thus he earned the reputation of a law and order citizen; won the gratitude of the rioters by his dramatic zeal in their behalf, and solidified himself with the labor organizations by which the trouble had been fomented. He made a poor stick of a sol­dier, being so conspicuously deficient in drill and so incapable of discipline that he was omitted from the roster of the company contests. On street parade he had an incur­able predilection for bowing to sidewalk ac­quaintances, and ceremoniously doffing his cap to the ladies. It was not the intention of Lewis long to serve the commonwealth in the capacity of a private militiaman. 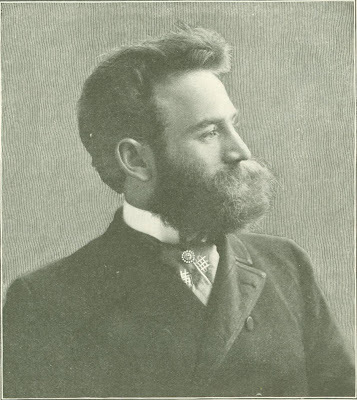 Governor Semple, ter­ritorial appointee of Cleveland, made him a lieutenant-colonel of staff. He afterwards became lieutenant-colonel of the First Washington, and then inspector-general with rank of colonel. "Colonel" Lewis, like "Dude" Lewis and "Habeas Corpus" Lewis, was very much of a joke, laughed at by Democrats and Republicans. The colonel, while Con­gressman, reached the zenith of his military glory in a mysterious junket to Newport News, where he donned a Khaki uniform, bearing the insignia of a colonel's rank, not of the "U. S. A.," but of the National Guard of Washington. Now the colonel pre­tends to have been appointed by General Brooke as a member of General Frederick Grant's staff at the solicitation of Judge McKenna. Everyone knows that neither regimental nor staff appointments were made in such manner, and that judges of the Su­preme Court, whatever their other occupa­tions, are not given to promoting the effi­ciency of the army by seeking military ge­nius in Congress and conniving to send it to the front. The knowledge of the War De­partment is that at his own solicitation Con­gressman Lewis was permitted to accompany General Grant to Porto Rico as a civilian. This he failed to do. But out of the occulta­tion of the twelve days' service of "Colonel" Lewis at Newport News as "inspector-gen­eral on the staff of General Grant" came the startling disclosures which led to the beef scandal. He did it, and he was the secret emissary of General Miles. Such was the avowal of Congressman Lewis to his constit­uency. And then the colonel, instead of rushing headlong into war or the sanitary defense of the army, hastened across the continent to conduct a campaign that was disastrous to him. Possibly in this brief outline of the colo­nel's military fame at home, and the hard­ships the Congressman suffered in rescuing San Juan from the assault of hypothetically bad meat, may be discovered his dislike of "military satraps." "It is the proposition of those who govern you that in this country, with its 68,000,000 of people, with a volume of business which exceeds $22,000,000,000, and a public debt which exceeds $32,000,000, you are met with a proposition that the amount of money with which your country may do its business is to be divided. You are told the stool shall stand on three legs; that there is $5,000,­000,000 in gold, with $1,000,000,000 re­serve, making it $6,000,000,000. You are told that there is $5,000,000,000 accessible in silver, and given to understand that there is $5,000,000,000 more of what is known as greenbacks. In other words, the aggregate of $16,000,000,000." "My friends, the terms are more or less perplexed in my memory. I do not know why I have used those words million and billion; it is not because of physical exhaus­tion; it seems to be mental annoyance. I have used the word billion instead of million in the amount of money, and used the word million instead of the word billion. Your debt runs into thirty-three billions of dol­lars. You understand it was but a slip of the tongue." Later in the same debate his gold cur­rency took on a dreadful emaciation. "These gentlemen say that the gold will leave the country," said he. "I ask where will it go? Will these gentlemen take this $6,000,000 of gold and dump it into the Atlantic to add to Captain Kidd's treasure? Where is that six"—here the chairman reminded him that he meant $600,000,000—"yes, hundred million of dollars going that is going to leave this country?" These statements are quoted from a sten­ographic report of his speech. Another instance of this singular perver­sion is found in the oft-repeated charge he made that Mr. Hanna had swindled the Gov­ernment in the sale of the yacht Corsair. He stated the cost of the vessel at various times to have been $18,000, $48,000 and $60,000; and the Government purchase price $102,000, $115,000 and $118,000. The facts were that the yacht cost $155,000, and was sold to the auxiliary board for $115,000. Commerce be once opposed the local Nicar­agua Canal agitation on the ground that if a ship channel were cut from the Gulf of Mexico to the Pacific Ocean the exportation of flour from Puget Sound to China and Japan would cease, and India, with its cheap labor, would flood those countries with wheat. It may be said of Lewis that he is a law­yer of cultivated eccentricities, gifted with methods of practice that are unique and puzzling to the ablest members of the bench and bar, as well as to the many partners he has had. He is possessed of an amazing fund of misinformation or half-information that no sense of the ludicrous or fear of cor­rective rebuke deters him from exploiting. In plausibility of argument and persuasive­ness of manner he is exceptionally talented. Though he no longer courts reputation as a criminal lawyer, he is without a peer at that practice in his state. He has defended thirty-two murderers and lost only one ver­dict in the first degree. In this case he se­cured a reversal, and finally acquitted the accused. This was a German named Fred­erich who went to Seattle to visit a friend named Scherbring. Shortly after arriving, he discovered from correspondence that Scherbring had become engaged to the girl in Germany who had been the sweetheart and promised wife of Frederich. Actuated by jealousy, he coaxed his friend out to a beer garden and there killed him. The case rested on circumstantial evidence. Feeling ran high, and the defendant was convicted. Written testimony from Germany was used against Frederich. After five successive ap­peals in different form, Lewis had the con­viction set aside on the ground that the tes­timony taken under the German law was in­valid under the Constitution of the United States. One of the cases which attracted great attention for the daring position of the de­fense was that of a young man named George Williams, who brained the superintendent of the Port Blakely Lumber Mill with a frag­ment of iron pipe. The deceased was shown to have been a tyrannical superior. Lewis defended Williams on the ground that the superintendent, though a man in form, was a beast in character; that it was the indi­rect order of God some man should kill him; that Williams simply performed a duty to society. An acquittal followed, to the utter consternation of the county, the jury going to the extent of inquiring if there was no way in which Williams could be indemnified the meshes of misrepresentation in which he became entangled at the start. Perhaps the most comical posture he assumed was that of a patriotic Bryan Democrat weeping over the valiant onslaught at Santiago of the Sixty-ninth New York and the Twenty-sixth Michigan, when as a matter of fact one regi­ment had not been sent to Cuba and the other was not in existence. Lewis is also deficient in geometrical com­prehension. Orographic and topographical lines are meaningless to him. Land plats or diagrams of whatever sort convey to his mind no idea of relative area or distance. To no drawing or map can he mentally ad­just the points of the compass. His most ridiculous opacity is in the matter of geography. Before the Seattle Chamber of for the two years and a half he spent in jail awaiting trial. Martin Phillips, a member of a religious sect, a Canadian by birth, who lived on San Juan Island, married a woman not of this sect. His home was surrounded by neigh­bors, who insisted on performing religious rites in the night. Phillips stepped to his door and fired several shots from his Win­chester rifle. The night was so dark he could not see the invaders. Next morning in the mud and water around the premises were found his own brother, one woman and two men, all dead. Besides, several others were wounded. Lewis. got a change of venue, de­fended Williams upon the ground that this religious sect having invaded his home were rioters, and so frightened his wife that she was threatened with mental collapse ; that Phillips was justified in killing all who par­ticipated in producing such a result upon a member of his family. Phillips was acquit­ted, but compelled to return to Canada. Paul Page, son of the ex-Mayor of Mil­waukee, while on his way to Alaska, killed the proprietor of one of the principal hotels at Seattle over a dispute growing out of a poker game. Page had been educated in Paris, where he had formed the absinthe habit. Lewis' defense was that Page had been given Cannabis Indica, or what is known as "Hasheesh," and his vision had become so distorted that he was unable to distinguish between the man who was robbing him in the game and the proprietor of the hotel; that having a just cause to kill the player who was robbing him, he killed the propri­etor under a mistaken sense of identity. Page was acquitted. The case was discussed in the leading medical journals of the world, not one of them agreeing with Lewis' theory, though he had persuaded the jury to do so. What is known as the Nordstrom case best illustrates the resourcefulness of Lewis. Nordstrom, a Swedish citizen, was sentenced to be hanged six years ago, and the evidence against him was circumstantially so com­plete that no one thought he had a chance to escape the gallows. Lewis was engaged by the Swedish Consul to attempt his rescue. With one technicality and another, he has taken the case four times before the state Supreme Court and three times before the Supreme Court of the United States. Nord­strom has been sentenced to death seven times, and is at present awaiting the disposition of another appeal. "He is everything to everybody." Although Lewis is a great conjurer with juries, his successes are mainly attributable to his extraordinary industry, his tireless application to the work in hand, and his intimacy with the books. It is said of him that he can find more bad law for a bad case than any lawyer in the state, and that scarcely any question can arise in the practice at which he has become so skilled upon which he is not prepared to cite au­thorities. These may not always be in his favor, but his memorized references will al­most invariably disclose the subject matter at controversy. This advantage was long ago recognized at the bar as his most substantial resource. If the human brain was properly likened by De Quincey to the palimpsest of the ancients, that of Lewis fails to disclose under the fluid action of the will the literary treasures committed to its keep­ing. He quotes philosophy, he quotes poetry, he quotes economics, he quotes Scrip­ture, he quotes Latin—and almost invariably mis­quotes. But to the multitude, such are his suav­ity and address that his misquota­tions serve to clothe him with t h e dignity and wisdom of the sage. He has, moreover, an amusing infelic­ity in his scholas­tic flights. He affects to esteem Hortensius high­ly, to revere Cic­ero as his model, and he has discoursed glibly about Jeremy Bentham as their con­temporary. In concluding a brief to be filed in the state Supreme Court once, he made a lengthy quotation from Virgil, accrediting it to Homer. When the error was pointed out by a law partner, he exclaimed, indig­nantly, "Confound that stenographer!" In smoothing over his bad breaks, he is never wanting in readiness of excuse. On the stump once he scored a political op­ponent as a "horrible Centaur with the head of a human being and the body of a snake." When a friend challenged his information next day, he replied: "That is nothing, my dear boy - a mere slip of the tongue." "Gibbon was right when he said, 'Rome never lost her liberty until the money, the life-blood of the country, was sapped from her vitals by the hands permitted to lay themselves upon the ventri­cles of her free heart, and draw the blood from her, and when the light of the re­public went out, the life of her citi­zens expired.' "
In March, 1893, shortly after Cleveland had been inaugurated, the central com­mittee and the leading Demo­crats met for the purpose of selecting candidates to be recom­mended to the President for the federal ap­pointments in the State of Washington. Lewis opposed the plan and addressed the conference on a resolution presented by him­self, the purport of which was that the com­mittee should not act in the matter. 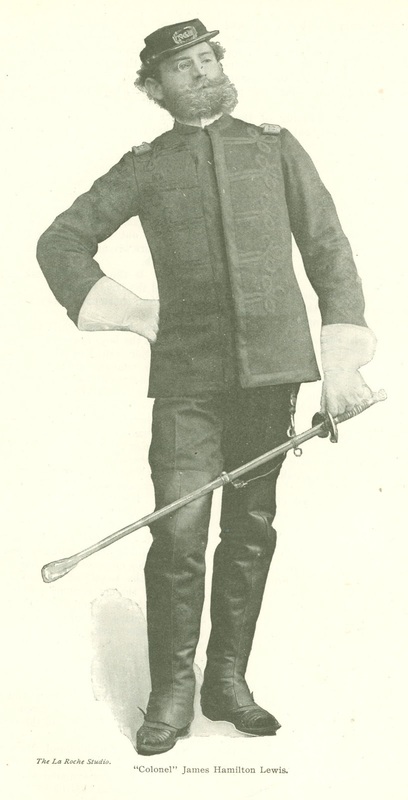 Captain W. D. O'Toole, a West Pointer, replying to Lewis, said that inasmuch as the Democrats of the state had no representa­tive in Congress to advise the President as to the character or fitness of candidates, the central committee could with all propriety "The Professor is not much with plates, knives, balls, and bowls; but when it comes to juggling with figures, he beats them all." The Aristocrat and expediency announce their preferences to him as a senatus consultum—the literal meaning of which is "a decree of the sen­ate." Captain O'Toole used the expression in an advisory sense. Lewis jumped to his feet and exclaimed with tragical breath, "I thank my classi­cal friend for his allusion to the senatus consultum of Rome. Now, Mr. Chairman, what became of that infamous body? It sold the crown to the nefarious Pertinax, and they were hurled from the Tarpeian Rock into the sea by an infuriated popu­lace." Lewis was not inaptly described by a col­league in the House as "an incomprehensible political paradox." Although in externals and mental make-up a tangle of contrari­eties, as a self-centered creation in the hu­man kingdom he is a phenomenon. He is in politics to remain, and however he may modify or cultivate his eccentricities, he is become a factor always to be reckoned with in the State of Washington. 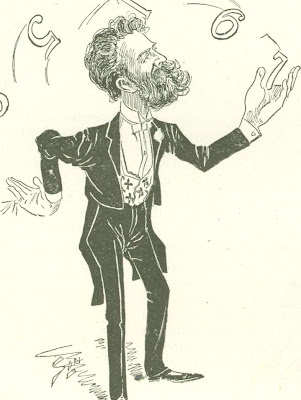 From Ainslee’s Magazine, May 1900.